The Hay Academy is a skills development programme that gives talented young people from across the UK, aged 18–25, the opportunity to join the Hay Festival team to develop their skills, knowledge, and potential career path in the creative industries, while volunteering in a professional working environment. Young people who’ve attended a Hay Academy have gone on to run festivals, write books and films, and to enjoy careers in publishing and in the wider creative and media industries. The Hay Academy is a fantastic opportunity to gain valuable experience in one of the world’s leading festivals. Meeting industry professionals, learning new skills, making new friends and contacts and gaining an understanding of possible career paths open to you, make it a festival not to be missed. All students are provided with a return travel ticket to the festival, accommodation and breakfast, lunch and dinner in the on-site crew catering facility. The Festival production team are involved in the planning and delivery of all production elements for Hay Festival. Participants will work closely with the Production Director and Technical Director to ensure all production, on-site and technical requirements are successfully managed and delivered across all festival operations. The 2019 festival dates are Thursday 23 May–Sunday 2 June. All applicants will need to be available for 2-3 days in May 2019 prior to the festival and for 5 days during the festival. We are looking for two young people, between the ages of 18 and 25, who can demonstrate a passion for festival production. The deadline for 2019 applications has now passed, and we will let applicants know whether they've been successful as soon as possible. Hay Festival has been capturing digital content for more than 20 years and has significant experience in understanding the complexities of both video and audio capture from live stages. Each year we work with students to assist with the live camera operation in three of our major venues. Students will take part in a workshop prior to the Festival, covering framing, focusing and colour-balancing. 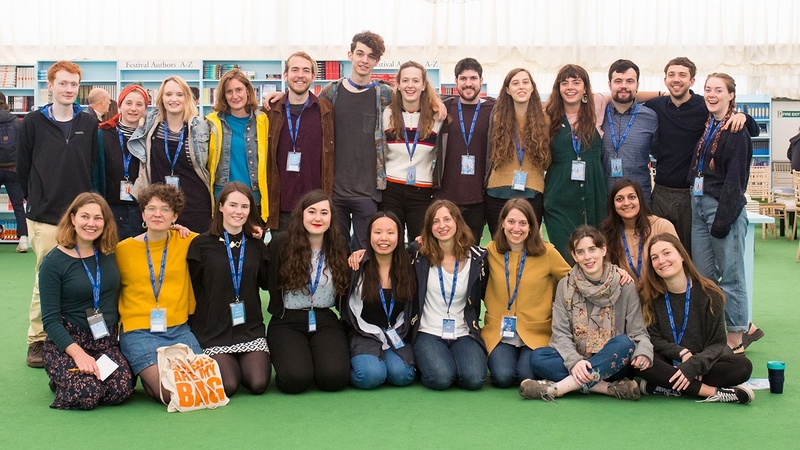 At the Festival, students will operate broadcast cameras, working alongside professional directors and technicians filming approximately 200 events over the 11 days of Hay Festival. The events that are captured are shared to audiences via live screen relay and internationally via our media partners on BBC Arts online and BBC iPlayer, along with Hay social media channels and Hay Player. It’s a fantastic opportunity to work in a live environment, filming some of the world’s greatest writers and artists. All students will gain vital experience in live capture. All applicants will need to be available for an introductory training workshop day in Brecon on May 8th 2019. The 2019 festival dates are Thursday 23 May–Sunday 2 June. Applicants will need to be available for the duration of the Festival. We are looking for 10–12 graduate or postgraduate students, of film or broadcast media, up to the age of 25, who plan to pursue a career in the television, cinema or corporate film industries. Each year the Hay Festival attracts some of the world’s leading writers, artists and thinkers, to talk, share their thoughts and ideas and meet audiences. Ensuring guests are warmly received and well looked after during their stay has always been a crucial mission and one of the Festival’s key jobs. All events management student volunteers need to be attentive and helpful. In return, they get the chance to meet some amazing, creative people, and experience the daily running of a fast-moving international festival, where time-keeping is important and, above all, performers and audience leave having had a thoroughly enjoyable, stimulating and thought-provoking day. Events management student volunteers help out with a wide range of duties including meeting and greeting authors, assisting with book signings, hospitality in the green room, accompanying artists to events, stage management assistance and manning reception desks. Creative workshops student volunteers assist authors, illustrators and workshop leaders in the setting up and running of workshops. They also help with book signings, hospitality in the green room and stage management assistance. These roles may interest those who have a particular interest in visual arts and/or illustration. The 2019 festival dates are Thursday 23 May–Sunday 2 June. All applicants will need to be available for an introductory training workshop day in April 2019. Applicants will need to be available for the duration of the festival. We are looking for 24 young people between the ages of 18 and 25, who can demonstrate a passion for the arts and interest in events management. Over the 11 days of the Festival we welcome journalists, press and broadcasters from around the world, all eager to share their stories, articles and photographs of the festival with a global audience. Press office volunteers are based in the Press office on the Festival site, and work with our Publicity Director to help meet the needs of the world’s press. You will help with tasks such as greeting and helping journalists, confirming press accreditation, collating daily press reports and facilitating interviews with authors and performers. The Press office is a hub of activity and provides invaluable experience for anyone interested in pursuing a career in press and publicity. You must be an excellent communicator, highly motivated and organised. Press Office applicants will need to be available from 21 May to 2 June. The 2019 festival dates are Thursday 23 May–Sunday 2 June. We are looking for three graduate students, up to the age of 25, who are eager to gain experience in publicity and arts events.